Caribbean Women’s Power Lunch participants. The T&T launch of the Caribbean Women’s Power Lunch (CWPL) will take place on March 31 in Trinidad and April 6 in Tobago. The event is hosted by president of Kerra Denel Entertainment, Kerra Denel. This will be the fourth and fifth editions of CWPL, which began in Toronto with back to back events, followed by Miami, and Denel said it is now being introduced to the T&T market. Denel added: “CWPL has been extremely blessed to have it graced by some amazing influential speakers such as Nneka Elliott, Auntie Jillian, Kamshuka, Hazel Smith, Ayanna Sealey, Stachen Frederick, Stephanie Lowe, Kim Thomas, Kavita Suri, Kym Niles, Lissa Monet, Makini Smith, Reesee Zigga Zagga, Chandra Maharaj, Giselle Blanche, Simone Russell, Rochelle Gapere, Vanessa James and Alexis Nunes. “The momentum for CWPL is growing and I want to continue to create platforms that can impact the lives of others. The panel of speakers for the Trinidad event, to be held at the Hyatt Regency Hotel from 1 pm to 5 pm, will include Grammy winner Angela Hunte, Managing Director Wendy John, Dr Shenilee Hazell, Creative Director Candace Sobion, engineer Natalie Fonrose and CNC3 News Anchor Hema Ramkissoon. 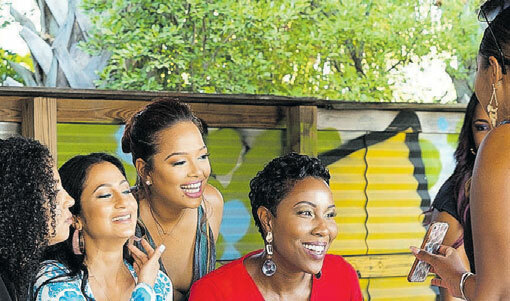 The Tobago event, which will take place at Poolside Haven from 5 pm to 9 pm, will feature speakers such as Business Coach Kelisha Mills, Dr Alina Williams, Tobago News Anchor Kristen Salandy, Business Owner Adeela Carter, Motivational Speaker Tashia Burris and International Certified Cosmetologist Cheyenne Gilbert. Denel, who was born in Trinidad and moved to Toronto, Canada, as a child, said her greatest inspirations are my mother and grandmother. She said: “Some other women who have inspired me in countless ways are Jinelle Mitchell, Chandra Maharaj, Shireen Saldenah, Christina Bailey, Atiya Greene-Cox, Crystal Kilgour, Giselle Blanche, Wendy John and most recently Cynell Aubin, a young entrepreneur in T&T. In addition to being the president of her company and curator of the CWPL, she is the Editor-in-Chief of Du Soleil magazine and chairman of the charitable foundation bearing her name Kerra Loves Kids (KLK). She said the biggest lesson she has learned is, “to not feed into negative energy. It is so important to maintain a positive state of mind at all times and approach every situation with love in my heart. “I’ve also learnt that people’s opinions of me are irrelevant and does not dictate who I am or what I am capable of achieving. We are all magnificent in our own way, so be proud of yourself through the highs and lows because only you know your true potential. Denel said this event targets all women of the Caribbean diaspora from all walks of life. “For as long as I’ve known myself I’ve always had a passion for people and seeing others succeed. Even though I have produced a number of different styled events, this one for me feels like I’m fulfilling my purpose. The joy it brings me to bring people together for a greater purpose is unexplainable. My hope is that women leave feeling empowered and renewed. Tickets can be purchased online by visiting www. islandetickets.com Contact 790-5717 and visit www.kerradenel.com for more information.